Mr. Claus will call upon Big Bear Snow Play for a day of photos and, yes, riding the hill. Wheeee! That's the Jolly Old Elf savoring some snowy high jinks. 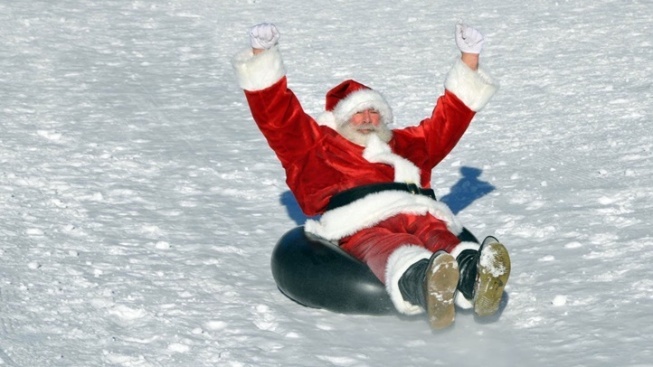 He'll be back for some more tube-based slides on Saturday, Dec. 16 at Big Bear Snow Play. SATURDAY, DEC. 16: True, true, he'll be swinging by the chilly destination for a few fun photographs inside the lodge, so that's really the focus of his day in the mountains. His hours on that date? Ten in the morning through to 4 o'clock, and visiting with him is totally free. You can snap a picture with the acclaimed elf before hitting the hills, or you can take on the park first, which will surely give your hair a spin and put some chill in your cheeks (a pretty perfect look for posing with Santa, who is so often on the move in cold climes). It's $35 to go tubing, and, you got it, there's a pair of Magic Carpet uphill lifts, so you don't need to trudge back up, time after time after time, if trudging back up isn't your jam. When will Santa finally hop onto a tube of his own? That remains a mystery, like so much surrounding the magic of Christmas, but perhaps, if you're fortunate, you'll see the famous figure zoom by you on the hill, faster than a sleigh in the night.